Tasty? This pack is a no go for me. I think really I just picked the wrong item for the task. 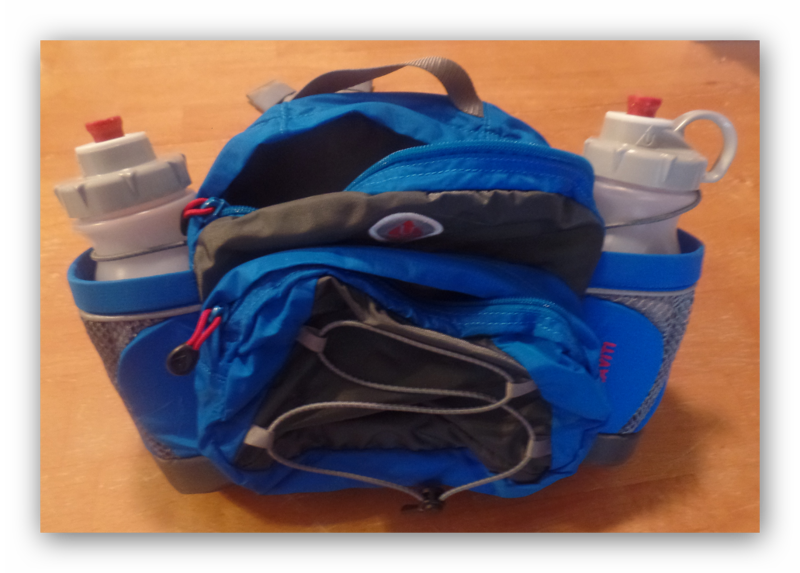 I was looking for a pretty well contained running belt that would let me haul along a couple of bottles of water, a jacket, some gels, and a small single use first aid kit. This pack really could carry way more than that and it looks like its meant more for hiking or walking. When I filled the water bottles and stuffed the items in the belt it felt heavier than I expected. However, its the ride that matters, so I took it for several test spins on the treadmill trying to adjust the placement on the hips and the circumference of the belt. I fiddled around for about 30 minutes, but no matter how I tried the water bottles bounced like crazy and it was just generally uncomfortable to run in. It might work for walking or hiking, but it did not meet my needs for running. That said I do have another Ultimate Direction pack that I am playing with and having much much better luck with, more on that later. For the moment I would carefully consider other options if you are a runner.